TRACE32-ICD are microprocessor development tools based on the debug and trace logic (BDM, JTAG, ETM, OCDS, NEXUS) integrated on the chip. On this basis TRACE32-ICD provides a highly cost effective debugger plus a powerful trace and run time analysis tool. TRACE32-ICD can be connected to the host by an ethernet, USB or LPT interface. The TRACE32 In-Circuit Debuggers are highly cost effective tools for debugging on assembler or HLL level. The ICD-Debugger are mainly used as stand-alone debugger on a PC or workstation. But they are also offered as an extension to the In-Circuit Emulator TRACE32-ICE using the PODBUS connector on the ECU32. In this configuration they can be used to debug a second CPU on the target. The ICD-Debugger is based on the on-chip debug interface (e.g. BDM, ONCE, JTAG etc.). TRACE32-ICD supports all extra features offered by on-chip debug interface like hardware breakpoints or trigger capabilities. An optional EPROM/FLASH Simulator is provided to allow the settting of breakpoints in the ROM area. For microcontrollers with NEXUS port an integrated Debugger/Trace/Performance-Analyzer System is on development. The ICD-Debugger is based on a ROM Monitor solution. An 8KB monitor program may be located anywhere in the address space. The monitor can be linked and loaded separatly or ist can be linked and loaded along with the user program. To implement the monitor, some interrupt vectors must be reserved for the monitor program use and these must be allowed for in the target software design. The communication between the Debugger on the host and the monitor program is done using an EPROM/FLASH simulator. The EPROM simulator can support two 8-bit or one 16-bit EPROM. The combination of several modules allows 32- or 64-bit configurations to be supported. During the simulation the EPROM configuration of the target system can be imitated by the software in the EPROM simulator. Using this technique paged or banked EPROM壮 can be simulated. For more information on the EPROM simulator refer to its documentation. The state/timing analyzer module is a full 64 channel logic analyzer module. It is connected via the POD-Bus. 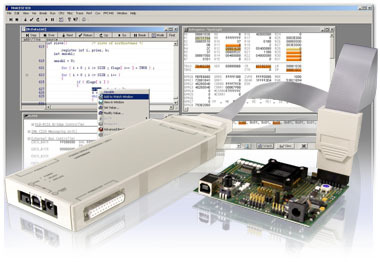 The state/timing analyzer logic analyzer is especially designed for system integration. It is connected via the POD-Bus. The Stimuli Generator is a extension the TRACE32-ICD In-Circuit Debuggers. 64 digital and 12 analog channels are available. The trigger probe enables the usage of external trigger events in an in-circuit debugger system. One PODBUS can controll up to 4 independent devices. Each device or each combination of devices is controlled by a different user interface. The TRACE32 software allows to start and stop multiple devices synchronously to offer multiprocessor debugging. Using this configuration e.g. one master can controll up to 3 slaves. Support for serial trace ports, each lane max.